Welcome to the 8th installment in the God of War franchise and the sequel to God of War III. Iif you haven’t looked much into this game, be ready for a different experience from any other God of War game you’ve played so far. They have added more RPG elements and changed up the combat system from what you are used to. No more going in hacking and slashing your way to victory. These are a welcomed change to the series and even with everything they have changed, it still feels like God of War. The beauty of this game is that there is nothing missable, so my suggestion is to just play and enjoy the story as you can go back after you finish it and collect whatever you missed. There are some collectables that you cannot obtain right anyway until you unlock certain skills anyway. You can play on whatever difficulty you would like as there are no difficulty-related trophies. I chose normal, and it can still be challenging at times, and I had my fair share of deaths. Just pick whatever difficulty you feel like doing and enjoy the game. Once you’ve beaten the game, go back and finish up with any collectables or side quests you may have missed or were unable to obtain or complete at the time because you didn’t have the abilities to do so. You can view collectable guide here to help. You should also focus on any other non-collectable or side quest related trophies you may not have gotten when going through the main quest line. I would save this for last, as they will be the more challenging of the bunch. Here is where you should visit Niflheim and Muspelheim, as well as defeat any Valkyries you have left along with the Valkyrie Queen. I suggest saving the Queen for last, as she is the hardest enemy in the game, so complete your trials and obtain the chests in the central chamber of Niflheim so you can use the best armor in the game as well as have your weapons fully upgraded. Congratulations! You’ve collected all the trophies and became a godly father! To learn the language, you must find the ciphers that are located in chests. There are four ciphers to collect per language, so you will need a total of eight. There are more chests than ciphers needed, and you do not need to find and open all of these chests for the platinum. You will be able to tell it is a cipher chest, as there will be emit a purple color and have a floating mask in the middle. Refer to the collectable guide for the locations of the cipher chests. In order to upgrade a piece of armor, you will first need to craft a piece of armor, as you cannot upgrade your original armor. Go to Brok’s shop and go to the “Upgrade” section. Select one of the three pieces of armor and upgrade it. By the time you first get to Brok’s, you should already have the materials necessary to do so, as it should cost you under 1,000 Hacksliver and a few pieces of Soft Svartalfheim Steel. While doing the main quest “Path to the Mountain”, Atreus will notify you of a chest along the main path. Go to it and open it to retrieve the rune and equip it. This will be the first of many runes you will come across. You will obtain more of them by chests and dropped by enemies. There are a total of 9 Iðunn’s Apples to find. These are located in the Nornir chests, the ones with the three rune symbols on them. Find the chest and break the seals to open them. You will have to find each one of the symbols that are scattered nearby and break them, rotate them to display the correct symbol, or throw your axe at them to make them gong in quick enough succession. Every three you collect will upgrade your health meter. Refer to the collectable guide for all the locations of the Nornir chests. There are a total of 9 Horns of Blood Mead to find. These are located in the Nornir chests, the ones with the three runes on them. Find the chest and break the seal to open them. You will have to find each one of the symbols that are scattered nearby and break them, rotate them to display the correct symbol, or throw your axe at them to make them gong in quick enough succession. Every three you collect will upgrade your rage meter. Refer to the collectable guide for all the locations of the Nornir chests. You’ll need at least 10,000 Hacksilver and 2 Soft Svartalfheim Steel. Go to Brok’s shop and choose “Atreus Armor” from the menu. Choose whichever armor you prefer and hold to craft it. In order to slot an enchantment into your armor, first you must upgrade your armor so it will have a slot for it. High-tier crafted armor will also start with a slot. Go to your armor and press to bring up the socket slot, and then equip an enchantment into the slot. You’ll obtain this naturally through the course of going for the platinum. There are plenty of enemies throughout the game. Just keep on slaughtering and you’ll reach the amount you need. I obtained this towards the end and with most of my side stuff completed and collected. There are a total of 3 Dragons to locate and free. Fafnir – Located on the East dock of The Mason’s Channel behind the door. There are three rune shrines that you must destroy in order to be able to free them. They will be located in the area where the dragons are being held. Once destroyed, return back to the dragon and interact with the object that has the dragon bound and free it. There are a total of 5 quests you must complete between Brok and Sindri. They both have two separate quests to give you, and after you complete them, they will give you the last one after they have finally start to work together again. You only need to complete the side quests given to you in Midgard for this trophy. You will need to do these quests to unlock certain areas for when you are working on your collectables. When you get these quests, they will mark on the map exactly where you need to go. If the quests are not appearing for you, you will have to progress further into the main quest. There are extra side quests Sindri will give you when you enter Niflheim; they are not needed for the trophy. There are a total of 45 artifacts to find, none of which are missable. The map will show you how many are needed in each area when you scroll over a specific region. Refer to the collectable guide for the locations of the artifacts. This will sometimes count more ravens than you have actually found. This popped for me before I found all the ravens (I was missing 4). The tracker on the labor “The Eyes of Odin” showed more found than the tracker on the map. So this has a possibility of glitching for you in a good way. There are a total of 51 ravens to find, none of which are missable. When you are near, you will hear a metallic caw sound. These are the hardest collectables to find as they are not in most places you would normally look. Refer to the collectable guide for the locations of the ravens. You will automatically obtain a Runic Attack Gem during the second main quest “Path to the Mountain”. After that, you will start getting them as drops, chests, or rewards. There is only two upgrades to each rune. In order to upgrade it, go to the weapons tab in the main menu, then to the equipped rune (equip one if you haven’t yet) and then press to upgrade it. It only costs XP to upgrade, so no special item or material is needed. Do this two times for the trophy. If you just want to get the trophy out of the way, make a save before hand and then upgrade the rune twice and then reload the save in order not to waste your XP on something you do not wish to upgrade. You will need to upgrade the Leviathan Axe to level 6. To upgrade the Leviathan Axe, you will need an item called Frozen Flame which are dropped by defeating bosses. You will only be able to upgrade the axe to level 5 this way. In order to upgrade it to level 6, you will have to progress far enough along to be able to travel to the Niflheim realm. Once you can travel to Niflheim, you’ll be able to buy a Frozen Flame from the Dwarves. To buy one though, you’ll need to trade in an item called Chilling Mist of Niflheim. To get this, you will have to gather 5,000 Mist Echoes to open a chest in the central chamber of Niflheim. See Darkness and Fog on if you do not know how to obtain Mist Echoes and Trilingual if you do not know how to access Niflheim. Throughout your journey, you will run into Travelers, which are oversized knight-looking enemies with a two handed sword and a big shield. Once you defeat it and pick up the loot from it, a side quest called “The Road Less Traveled” will activate, where you have to bring an item you picked up off the Traveler to one of the Dwarven brothers. This will unlock the armor set for you. While exploring, doing side quests, and the collectables, you’ll run into more than enough needed to craft this set. Throughout your journey, you will run into Ancients, which is essentially a big rock monster. Once you defeat it and pick up the loot from it, a side quest called “Hearts of Stone” will activate, where you have to bring an item you picked up off the Ancient to one of the Dwarven brothers. This will unlock the armor set for you. While exploring, doing side quests, and the collectables, you’ll run into more than enough needed to craft this set. There are 5 different side quests you must complete for the spirits. Unfinished Business – You can trigger this at any of the 4 spots you must go to: Cliffs of the Raven, Isle of Death, Iron Cove, or Forgotten Caverns. You will read the inscription on the braziers, which will trigger a fight and then a spirit will appear for you to talk to. Do this for all four locations to complete the quest. Hammer Fall – You will trigger this in the Stone Falls area. This spirit will want you to venture into Veithurgard and take down a statue of Thor. Destroy the statue and return to the spirit to complete the quest. The Anatomy of Hope – You can get this in The Manson’s Channel area. You will need to collect 3 bones for the spirit, which will all be marked your map. Dead Freight – You can get this in the Forgotten Caverns area on the south dock. You will be tasked with killing the rest of his crew. They are easy to find, as they are marked on the map. Kill all of them in all 3 areas and return to the spirit to complete the quest. Time Heals All – In order to start this quest, you first must get a lore scroll at the end of Northri Stronghold. This is best done with the side quest “Family Business” from Sindri as it has you explore that area. Once you have the scroll, you will need to go to Fafnir’s Storeroom to give it to the spirit to complete. You can access the storeroom through the side quest “Fafnir’s Hoard”, given to you by Sindri. There are 12 treasure maps you need to find in order for the dig spots to appear. Here is a list of all the treasure maps and their locations. For their specific locations, refer to the video or collectable guide. Creation Island – Located in the Iron Cove region and the dig spot is in Buri’s Storeroom region. Dead and Bloated – Located in the Volunder Mines (need a side quest from Brok to access) and the dig spot is located in Cliffs of the Raven region. Don’t Blink – Located in Fafnir’s Storeroom and the dig spot is located in the Foothills region. Finder’s Fee – Located in the Forgotten Caverns and the dig spot is in the Northri Stronghold (need the side quest from Sindri to access). Hunter’s Kingdom – Located in the Lookout Tower region and the dig spot is in the Veithurgard region. Island of Light – Located in The Masion’s Channel region and the dig spot is in the Light Elf Outpost region. Kneel Before Thor! – Located in the Landsuther Mines (need a side quest from Brok to access) and the dig spot is located in Muspelheim Tower. Njord’s Oarsmen – Located in Northri Stronghold (need a side quest from Sindri to access) and the dig spot is in The Mason’s Channel region. The Boat Captain’s Key – Located in the Stone Falls region and the dig spot is in the Isle of Death region. The Historian – Located in the Ruins of the Ancients region and the dig spot is located in Fafnir’s Storeroom region. The Last Place They’d Look – Located in The Mountain region and the dig spot is at the Council of Valkyries region. There are a total of 11 Jötnar shrines to find, none of which are missable. They look like a big wooden cabinets that you will open and Atreus will read. Below is a list of the areas they are located in; for specific locations, refer to the collectable guide. To complete the trials, first you will have to gain access to Muspelheim. To do this you will need the 4 Language Ciphers found in the purple chests with the mask floating in the center. 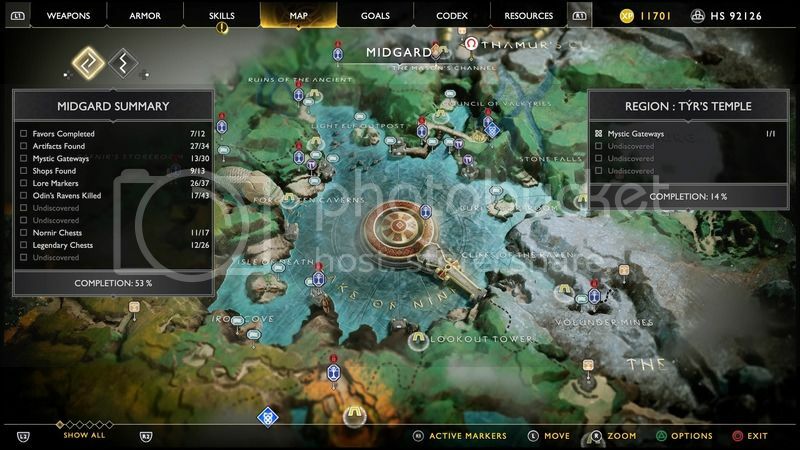 See Trilingual for the locations and how to unlock Muspelheim. Once in Muspelheim, there will be trials to complete. There are 6 different trials with 3 different difficulty levels. You do not need to beat all 6 trials on all three difficulties, but you will need to beat each trial 1-5 on normal and hard to progress to the next challenge. After the 5th trial, you will face a Valkyrie, which you will need to beat to gain access to the impossible difficulty and the 6th challenge. You will need to beat 3 trials on the impossible difficulty to gain 3 keys to take on the 6th and final trial. If you’re struggling with the trials, put the game difficulty on easy and sure all you are wearing the best armor you can currently use. I suggest doing trials 2, 3, and 5 for the impossible challenge. To get the treasures, first you will have to gain access to Niflheim. To do this you will need the 4 Language Ciphers found in the purple chests with the mask floating in the center. See Trilingual for the locations and how to unlock Niflheim. Once in Niflheim, you will have to complete the side quest “Ivaldi’s Workshop” in order to gain access to the central chamber, which is given to you by Sindri. There are 5 treasure chests you will need to open and 3 realm tears to defeat. In order to open the chests and tears, you will need 68,500 Mist Echoes and 3 Anchors of Fog. You can farm the Mist Echoes by opening chests while you go through the dungeon and Anchors of Fog are round randomly in legendary chests. Every time you enter, the traps and enemies are different. Take care not to die as well, you will lose all you’ve collected during the run. So if you’re worried, take a resurrection stone with you. If the timer runs out, then you will die as well. You are also able to sell stuff for Mist Echoes, but only stuff you find in Niflheim will work. You can sell them at the Dwarven shops. The more chests you are able to open, the more echoes you will receive per chest during your run. I suggest crafting the Mist armor set when you are able to do so, as it will help with your survival time while in the mist, plus it is the best armor in the game. Once I had the set crafted, I never fell under half way on the time limit. Valkyries are some of the toughest fights in the game, with the final one being the toughest in the game. To fight them, you will first have to progress far enough into the story to be able to open the hidden chambers. Six of the Vakyrie’s are located in the Hidden Chamber’s of Odin, while the others are located elsewhere. When going to face Sigrun, the final Valkyrie, you will want to prepare for her. It it suggested to go for a cooldown build. You will want to fully upgrade Sindri’s Royal Dwarven armor set, as it gives you a good deal of cooldown to your stats as well as will make you invulnerable when using your runic attacks. Also, slot any epic runes that have the cooldown stats in your armor. Make sure everything is fully upgraded. I used a fully upgraded Mist armor set, with cooldown runes and had little issues. Here are some tips to going up against the final Valkyrie, Sigrun. If you get low on health, use your Spartan Rage to regen health. Be sure to still dodge attacks. At the start of the game, you’ll go hunting with Atreus during the quest “The Marked Trees”. Once you make it back home a Stranger will visit you and a fight will commence. Once the battle is over with and you return home to get Atreus, the trophy will unlock. This takes place during the quest “Path to the Mountain”. After meeting your first shop keep and fighting another troll, you’ll run into some foggy woods in search of a boar Atreus shot. You’ll lose Atreus and run in search after him. You’ll find him with a Witch of the woods. Gather up some flowers to heal the boar and then she’ll set you on your way. After that, the trophy will unlock. This will unlock during the quest “The Light of Alfheim”. You’ll eventually make your way to the Lake of Nine where you’ll have to enter Alfheim and gather some of its light. Once you fight your way through Alfheim and rid the light of the Dark Elves corruption, you will return to the entrance to open the door to the Light Elves, which will net you the trophy. This will unlock during the quest “Inside the Mountain”. Once you get back to the mountain and purge the black breath that was stopping you from entering, you will venture forth until you find a claw to help you ascend to the top. Once you almost reach the top, a dragon named Hraezlyr will attack you. Once you defeat it, the trophy is yours. This will unlock during the quest “The Magic Chisel”. After beating the dragon, you’ll find where you were going, wasn’t where you were suppose to go. Now you will have to find a special chisel to travel to Jotunheim. When you reach the chisel, you’ll be forced to fight Magni and Modi. Defeat them for the trophy. This will unlock during the quest “The Sickness”. After beating the brothers and getting the chisel, you’ll return back the The Lakes of Nine and try and enter Tyr’s Vault. You’ll then get attacked by Modi and Atreus will fall ill. You’ll bring him to the Witch and then head to your house to pick up the weapons you’ve been waiting for. One you delightfully slaughter the enemies outside, the trophy will unlock. This will unlock when you complete the quest “The Sickness”. You will need to travel to Helheim and defeat the bridge keeper. Kill him and take his heart back to Freya. Once Atreus is back on his feet, the trophy will unlock. This will unlock when you complete the quest “Return to the Summit”. You’ll make your way back to the summit and end up fighting Baldur again. Once the battle is over, the trophy will unlock. This will unlock during the quest “Escape from Heheim”. After your battle with Baldur, you’ll be making your way towards a ship. Get on it and get your self unstuck from situations and also battle hoards of enemies. Once it’s over, you’ll leave the ship and the trophy will unlock. This will unlock when you complete the quest “Jotunheim in Reach. Once back in Midgard, you’ll have the Dwarves make you a key to Tyr’s hidden chamber. Enter it and retrieve the unity stone to bring back the tower to Jotunheim. Then you will have to travel into the World’s Serpents stomach to retrieve Mimir’s eye so you can travel to Jotunheim, until you get thrown from the serpents stomach and forced to fight and defeat Baldur. Once the battle is over the trophy will unlock. This will unlock when you complete the quest “Mother’s Ashes”. After the fight, you’ll travel back to the temple. Go to Jotunheim and finish what you first set out to do from the start. Once you have completed your task, the trophy will unlock. You will need to discover all the areas around the Lake of Nine. You won’t be able to do this when you first reach the area, as you will have to proceed through the story in order to access some of the areas needed. You will obtain this trophy when you are going for all your necessary collectables, as you will have to visit each place in order to get them. Veithurgard is located in the Lake of Nine, in the top right corner. To obtain this trophy, there is a temple you must access in the south of Veithurgard. You will fight your way through until you reach the end where you will have to fight a troll named Dauði Hamarr. Once you defeat him and open the final door, there will be a treasure. Loot it and the trophy is yours. It is not necessary to collect all the collectables to obtain the trophy, as I unlocked it without doing so, so I would suggest only focusing on the collectables needed for the trophies in this area. You will need to upgrade the Blades of Chaos to level 5. To upgrade the Blades of Chaos, you will need an item called Chaos Flames which are dropped by defeating bosses. You will only be able to upgrade the blades to level 4. In order to upgrade it to level 5, you will need to progress far enough to travel to Muspelheim. Once you can travel to Muspelheim, you’ll be able to buy a Chaos Flame from the the Dwarves. To buy one though, you’ll need to trade in an item called Raging Inferno of Muspelheim. To get this, you will have to defeat the Valkyrie in Muspelheim, which you can face after you beat the 5th trial. If you do not know how to access Muspelheim, see Trilingual.